Editor's Note: Julbo is a french company from the Jura Mountains near Switzerland located in the same valleys where the finest hand built watches are made. Founded in 1888, their earliest sunglasses launched over a 100 years ago were designed for crystal hunters in the Chamonix valley. 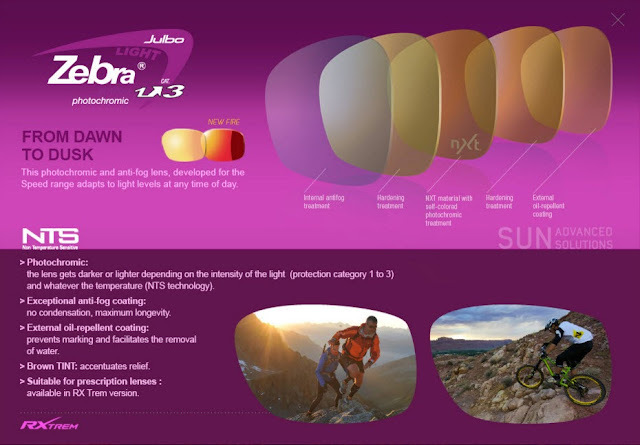 Since then Julbo has focused on high performance sun protection sunglasses and goggles for mountain and water environments. Maybe not as well known as the usual suspects, their quality and performance is appreciated by some of the finest mountain athletes out there In addition to famous extreme skier Glen Plake and Swiss speed mountaineer Uli Steck, many outstanding mountain runners including Rob Krar, Krissy Mohel, Stevie Kremer are Julbo sponsored athletes.Julbo is also well known for its fun and worthy line of stylish baby and children;s sunglasses. For years, the name Julbo conjured images in my mind of round glacier glasses with leather side shades worn by high altitude mountaineers. 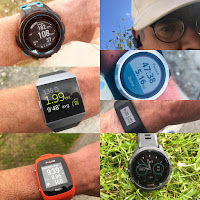 Over the past few years however, Julbo has really caught my attention and changed my perceptions as their newer offerings have become commonplace, perhaps even somewhat synonymous with the MUT (Mountain/Ultra/Trail) scene. A handful of my friends have been wearing them and after trying them briefly on local runs, I knew I had to have a pair. As luck would have it, Julbo graciously offered a pair of the new Zephyr with a Zebra 2-4 lens to review for RoadTrailRun. In addition, Sam also sent me his new Julbo Aero glasses with the Zebra Light 1-3 lens, primarily for the sake of lens comparison. The Zephyr is designed specifically for running (but is certainly appropriate for just about any other outdoor sport) and combined with the photochromic Zebra lens, I found this combination to be ideal for most days running here in Boulder, Colorado, where bright sunshine is the norm and brighter sunshine is guaranteed on the higher peaks. Combine snow and sensitive eyes, I wanted a single pair of glasses with a lens that would cover all of my bases, from the brightest conditions above tree line, to shaded forests and canyons. Starting with the frame, the Zephyr has a very sturdy and high quality feel to it. It is frameless around the lower lens for unobstructed visibility and the lens shape contours perfectly over and around my eyes with little to no chance of outside light penetrating. The lens has excellent panoramic coverage offering a wide field of vision. I would classify these glasses/lenses as being “medium” in size, as they are slightly large on my small face, though that is welcome, as I was looking for something more functional that would give me better coverage to keep out sunlight, glare and wind. Fit is amazing, for me they were nearly perfect right out of the box. The ear stems have what they call “Grip Tech” which is a variation of a sticky rubber that grabs well when dry or wet. In addition, the Zephyr also has “360 degree adjustable temples” which can be twisted in any direction to easily achieve a custom fit. The 3D Fit Nose is amazing, as it too adjusts side to side, as well as fore/aft to even further dial in the fit. Though a few grams heavier than the Aero model, the Zephyr feels quite light and with the customizable fit and Grip Tech, the glasses remained firmly planted on my face even at full speed on the most technical downhills. As amazing as this frame is, the photochromic (transitional) Zebra 2-4 lens is the main attraction. From the Julbo website NXT lens description: “Optimum qualities for an organic lens while benefiting from a mineral glass manufacturing technique (very low-temperature casting). Its transparency and stability over time are exceptional. It is ultra-light, unbreakable and solvent-resistant”. “The NXT lenses offer lightness, resistance and great optical quality combined with photochromic and polarizing technology”. 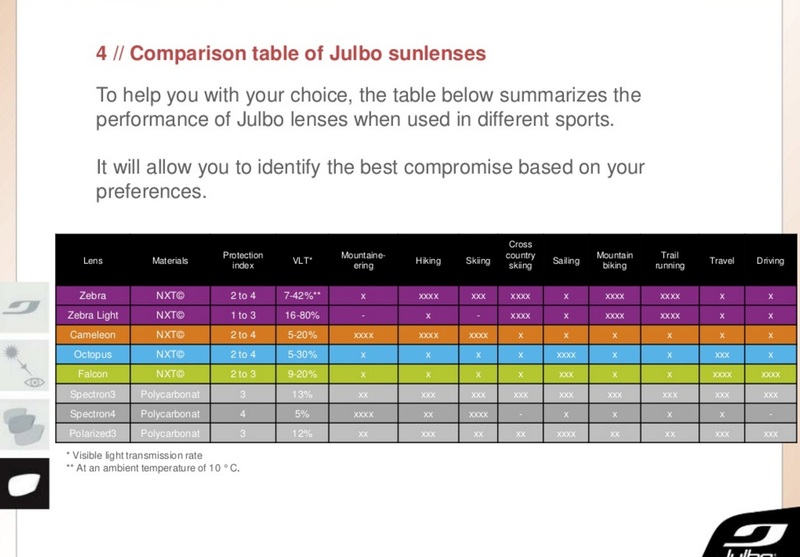 Though I do not entirely understand the verbiage and scientific chemical properties, I can however attest to the fact that these lenses have the very best optical clarity/quality that I have ever experienced (and I have owned many glasses, such as Oakley, Rudy Project, Smith, Briko and Bolle). The optics are so good, that I am able, in most scenarios, to run without my contact lenses, which I have not been able to comfortably do with other sunglasses with lesser optical clarity (I am somewhat nearsighted with a very mild prescription and normally wear contact lenses for running or any other outdoor activities). Having the Zebra lens also helps make this possible, as the lens is more likely to provide the proper level of shading for the conditions. Julbo calls the tint of the lens brown, but I find it to be more orange/amber, especially at the darkest tint. Either way, the lens offers the best hue for trail definition and it is very easy to discern minor obstacles, undulations, contours and shadows. In warmer temperature (over 50 degrees Fahrenheit), I found the Zebra lens to transition quickly in changing light conditions (Julbo claims less than 30 seconds) and the transition is so smooth and subtle that I hardly noticed it happening. The range of lighting conditions where the Zebra lens is appropriate is impressive, ranging from 42% light transmission (level 2) that works well in shaded areas or just before/after sunset, all the way to 7% light transmission (level 4) that is impressively dark and appropriate for the most brilliant sunny conditions at altitude, even with glaring snow reflections. In temperatures less than 50 degrees (F), I found the Zebra lens to be very slow to transition (if they would transition at all). More often than not in colder temperatures, they would darken and essentially stay dark until temperatures warmed, but this is well acknowledged by Julbo. 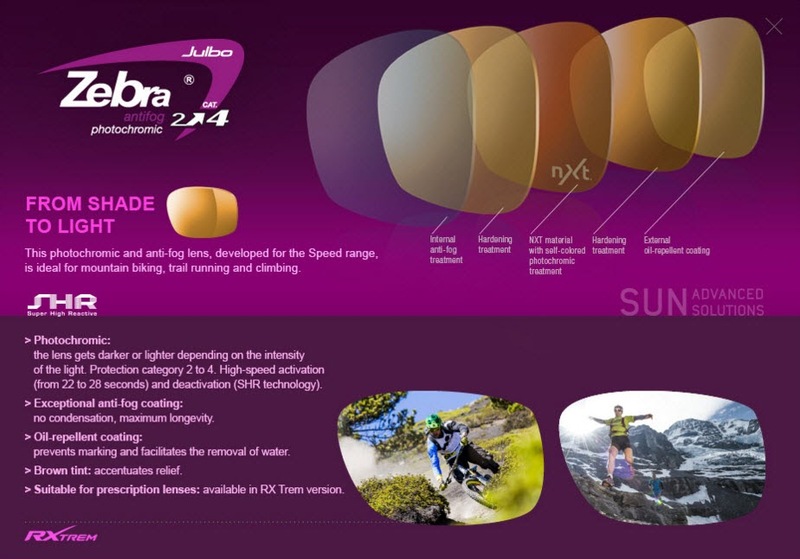 One other limitation that I found was that while driving (and the Julbo usage chart clearly states that they are not meant for driving), is that the Zebra lens, in the absence of UV rays, transitions to the lightest tint, which I found to be too light for my sensitive eyes. Some might not have a problem with this, but I need to keep a pair of non-photochromic glasses in the car. In addition to the excellent optical clarity, photochromic properties and durability, these lens have very good anti fog properties. Surprisingly, I could open the dishwasher or oven while they are in operation and not have them fog, where other glasses would be fogged over for minutes. Ventilation is excellent, aiding with anti-fogging and they clean very easily. In real world use, I have not yet been able to get them to fog, though I once had a bit of dampness form on the inside while putting out significant effort on steep terrain, in snow and windless condition. Once the terrain leveled a bit and I upped my pace some, the dampness disappeared. Any of my other glasses would have ended up on my hat or in my pocket in similar circumstances. 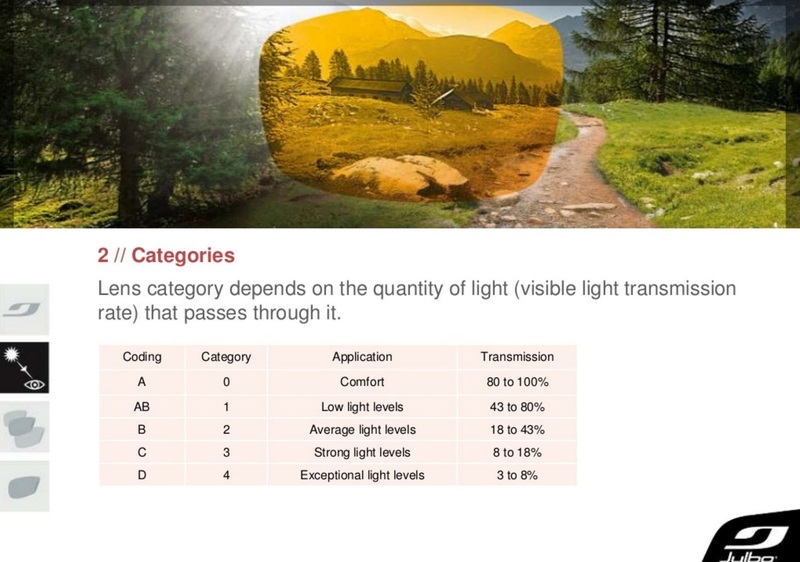 Another incentive for me to wear a photochromic lens is that since they cover such a wide range of lighting conditions, is that I am more likely to keep them on, which is a huge safety advantage. I do a lot of off trail running/hiking, but even on well-travelled trails, I have been surprised before and had close calls with branches nearly taking out an eye. Overall, I would highly recommend the Julbo Zephyr with Zebra lens to just about anybody, for trail running, road running, mountain biking, road riding, skiing, hiking, etc.... Quality is impeccable, fit is very secure, venting and anti-fogging properties are amazing and the Zebra lens works incredibly well, be it dawn, dusk or on the brightest, snowiest days. As mentioned above, Sam loaned me his new Julbo Aero glasses with the Zebra Light lens for a few weeks to draw side by side comparisons between the lenses. First, I feel inclined to comment on the Aero frame. These glasses are LIGHT, several grams lighter than the Zephyr and I believe these may be their lightest model (or at least one of the lightest models). They are exceptionally well ventilated with air vents, ports and intakes to channel air. virtually eliminating any chance of fogging. It is subtle enough though that I never felt as though it compromised wind protection. The fit of the Aero is excellent, aided by the 3D Fit Nose and the lower weight aided in keeping them, for the most part, firmly planted on my face. I did however find that no matter how I adjusted the 3D Fit Nose, I would get a little bounce when running downhill, especially faster technical downhills. I am sure this is a function of my smaller face, but when comparing the Aero with the Zephyr, I appreciated the greater level of custom fit that can be achieved with the 360 degree adjustable temples featured on the Zephyr. Initially, I was a bit skeptical of the Zebra Light with a 16% - 80% light transmission range (or 1-3), vs. 7% - 42% for the Zebra (2-4), or at least skeptical for my use here in Colorado and given that I am somewhat sensitive to bright light. I’ll just come out and say it, I was completely wrong in my assessment. In fact, I would venture to say that the Zebra Light has a slight advantage over the Zebra from a versatility standpoint. The Zebra Light is less temperature sensitive than the Zebra (Julbo claims the Light to not be temperature sensitive) and I did find that it transitioned quicker throughout a wider range of temperature and lighting conditions. With the lightest tint being 80%, you can wear these in very low light conditions, in the dark even if you had to. My biggest reservation though with the Zebra Light was whether or not, with a maximum darkness rating of 3 (16% light transmission), would they be dark enough for the brightest days here in Colorado? Even after wearing them for several days, I was still not convinced, even leaning toward no, but over the course of a few weeks, using them even on the brightest, most brilliant sunny days after a snowstorm, I ultimately concluded that they were indeed dark enough for my sensitive eyes. The Zebra lens (at 7% light transmission) was certainly better in those very brightest conditions, as my eyes felt a little more relaxed, but I am really impressed with how dark the Zebra Light lens could get at its maximum darkness. I even compared with my go to sunglasses for the past 10 years, which I always found to be plenty dark enough (at 11% light transmission) and the Zebra Light seemed equally dark. As I wear sunglasses over small metal frame prescription lens glasses without slipping, don't ask why... it's the way I rock! So, I look for a frame that will fit over my glasses. Given this, I also look for a lens with minimal reflections from the inevitable light gaps even with cap. As I already have a lens with some protective properties on, I also tend towards more light transmission for all but the brightest sun. I travel between New Hampshire with generally lower light intensity and Utah with a combination of high altitude sun, snow, but also considerable shade running in forests. I look for good contrast to trail obstacles. Finally, I want a lens through which my GPS watch is relatively visible. The Aero meets all these requirements. I have a pair of Rudy Project Rydon with photochromic ImpactX Clear Laser lenses rated 16%-62%, so the same maximum protection as the Zebra Light but which are also darker at their lightest as Light has 80% light transmission in lowest light vs. 62% for the Rudys. While excellent in summer,with rapid transitions, The Rudys are pretty much hopelessly dark when it is both cold and even a bit shady or in lower light. They transition to full dark, and I believe darker even than the full dark seen in warmer temperatures, and then stay there, no matter what, until "warmed up" inside. The Aero is little lighter protection overall with a broader utility for early and late runs with its 1-3 protection level and it is also not temperature sensitive. I tested Aero Zebra Light by running on a cold day into bright western setting sun and then back into approaching, then near darkness. I did not have to take them off to see for the full run. On a similar day my Rudy Projects were on my head as soon as I rounded back away from the setting sun and stayed fully dark. I also tested Aero while driving at night side by side with the Rudy Project and was able to safely see my way in the Aero but not with the Rudy thus demonstrating their night time, eye protection utility. The Aero meets all my needs for versatility, protection, and fit. I think it depends on where you live, what you use the glasses for, what time of day you exercise and how sensitive your eyes are. Zebra Light was designed for a broad range of temperatures and lower light intensity. It accomplishes this through a combination of a non-temperature sensitive photochromic materials and a 1-3 rating. It will tend to transition more consistently across all temperatures and will transition somewhat slower than the Zebra 2-4 in warmer temperatures. The transition time light to dark is about 18 seconds, and from dark to light in about 28 seconds. Find the Aero with Zebra Light 1-3 lens at Julbo here. Select lens type. • Frequent wide open areas or above tree line. Zebra was designed for rapid activation in temps from 50-90 F. It is temperature sensitive so in cold weather it will transition very fast to dark and tend to stay dark until warmed. 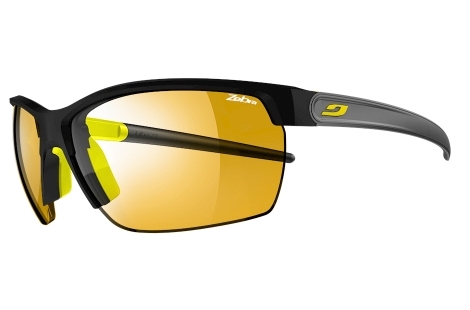 Find the Zephyr with Zebra 2-4 lens at Julbo here. Select lens type. 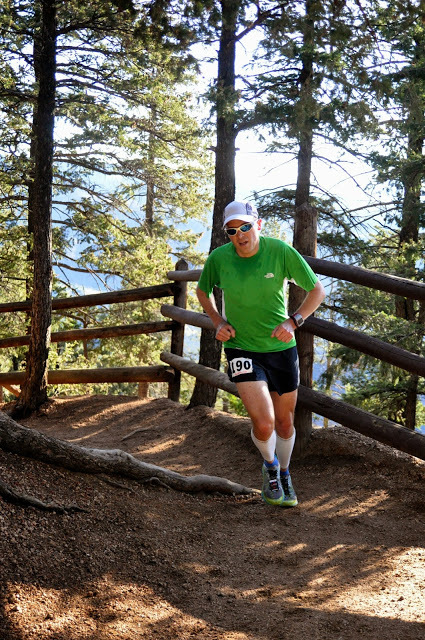 The Julbo sunglasses were provided at no charge to Road Trail Run. The opinions herein are entirely the authors'. 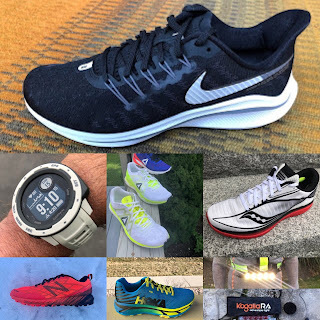 Thank you Jeff and Sam for this comprehensive review and comparison of lens and so many other factors - it was incredibly valuable and hit every point one would think about when buying performance sunglasses. This is precisely the type of detailed review that I look for when buying gear. Thank you very much Cathryn! Much appreciated!